Gluten is a type of protein that is commonly found in wheat and other grains, but some people’s bodies do not react well to gluten as it causes a variety of uncomfortable conditions. While many people might be gluten sensitive, only a few are truly gluten intolerant. Caregivers in Rhode Island explain some of the most common signs of gluten intolerance. The most common issue with gluten is that a person’s gastrointestinal system cannot properly digest it. People who are gluten intolerant often experience gas, bloating, and abdominal cramps after consuming it. Many people also have problems with constipation and diarrhea shortly after eating gluten. Providers of home care in Rhode Island may mistake these symptoms for indigestion or stomach problems, which is why it’s important for seniors to receive a diagnosis from a medical professional. When the body cannot digest gluten, it also can’t absorb certain nutrients properly such as vitamin A. A lack of these nutrients can cause skin conditions, such as keratosis pilaris that results in small bumps around hair follicles, eczema, and persistent itching. Gluten intolerance can also cause red rashes on different areas of the body. The body and brain’s natural processes are interrupted when gluten-intolerant people eat gluten. A person may feel tired, foggy, or fatigued, and these symptoms can continue for hours. Sometimes a migraine headache or dizziness may occur, and some people even report mood swings and depression after consuming gluten. Gluten intolerance most commonly occurs with another medical issue, especially autoimmune disorders. It is often linked to fibromyalgia, multiple sclerosis, lupus, ulcerative colitis, or rheumatoid arthritis. Most people who are gluten-intolerant are diagnosed with celiac disease, which means that their small intestine lining is damaged from consuming gluten. 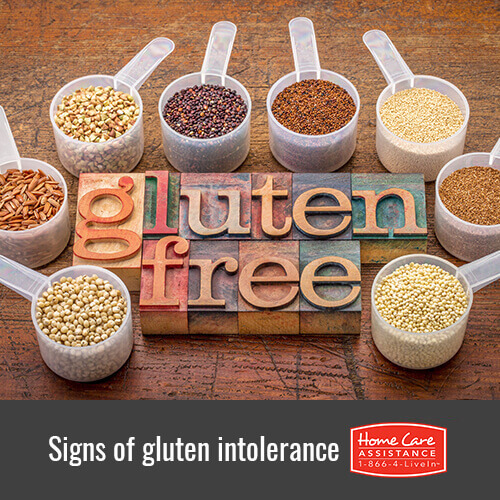 If you suspect your loved one is gluten intolerant, be sure to schedule an appointment with his or her doctor. Often doctors will recommend a restricted gluten-free diet to determine whether or not seniors have a sensitivity. This diet can be challenging for seniors to adhere to alone, but Home Care Assistance can help. We provide numerous services like Alzheimer’s, dementia, Parkinson’s, and stroke care in Rhode Island to help seniors manage these and other conditions in the comfort of home. Professional caregivers will help your loved one prepare a nutritious meal every day and help with tasks around the house. Learn more about how we can help your loved one today by calling (401) 284-0979 and scheduling a free consultation with a knowledgeable Care Manager.